Conservatory Designs state of the art Conservatory and Sunroom showroom is based at Johnstown Garden Centre on Exit 8 on M7 Motorway. 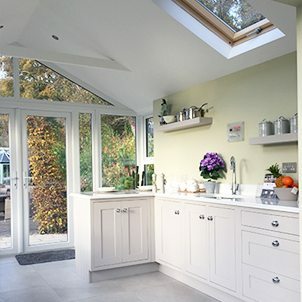 2017 saw further expansion of the showrooms with the addition of a kitchen extension and the new exciting new range of conservatory colours. We now have 8 permanent Conservatories and Sunrooms on display. These display rooms are in a range of sizes, designs and colours showcasing the very best of what is available and is a great aid for planning and visualising space and furniture layouts. Our showroom team are always available to help you with dimensions and budget pricing for your plans or you can book an appointment for a full design consultation with Mark Quinn. We have invested significantly in upgrading our software design systems to be able to offer even more exciting design options. Our design office on site currently offers a service where we can design your new Conservatory, Sunroom or Orangery in minutes while you watch allowing you have full input to the process and make changes as we create your new room. We can then print off the designs for you to bring home. Please note an appointment is required for this service. Please remember that this is a very important buying decision and it is vital that you know exactly what you are buying, don’t rely on fancy brochures, at our showrooms you can see and feel exactly what we will be building for you, no surprises. Our showrooms are open seven days a week, Monday to Saturday 9.00 am to 6.00 pm, Sundays and Bank holidays 11.00 am to 6.00 pm. Johnstown Garden Centre on Exit 8 on M7 Motorway. To get a free quote for any of our conservatories, orangeries, garden rooms or if you have any questions about how we can be of service to you please fill in the form below and we’ll get back to you as soon as possible. Please note that we are based in Johnstown Garden Centre, Naas, Co. Kildare, we currently just service the counties in the location form.